NAMFS recognizes the need for Code Officers to contact the appropriate party for resolution of property issues this release more than doubles the prior reach of ALLIANCE. The National Association of Mortgage Field Services (NAMFS), the premier trade association for the mortgage field service industry, is pleased to announce the release of a third round of enhancements to ALLIANCE – The NAMFS Code Enforcement Solution. ALLIANCE is a free, web-based solution located at NAMFS.org that has been designed to provide a solution for the industry as it relates to the challenges in connecting code enforcement officials and national field service providers for the mortgage servicing industry. To date, ALLIANCE has served over 750 code enforcement officials in over 400 unique jurisdictions nationwide. The steady increase in participation since its initial release has enabled the program to thrive and adapt to meet the ever-changing needs of this industry. Getting started with ALLIANCE is quick and easy. Code enforcement officials can complete the process in less than 15 minutes by following the links on NAMFS.org. 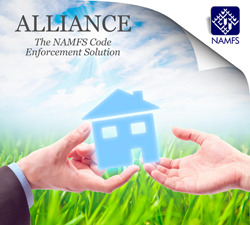 On March 7, NAMFS will be hosting a webinar for both potential and current users, to demonstrate these enhancements and share the benefits that ALLIANCE offers the code enforcement community. Please log on to the NAMFS webinar page to register to attend this valuable session.